When the time comes that you’ll need to leave the company, you’ll want to notify your employer that you’re going to do so. You cannot just exit thinking that everything will be fine without your employer’s approval, which is exactly why you’ll need to address the matter in a proper way. 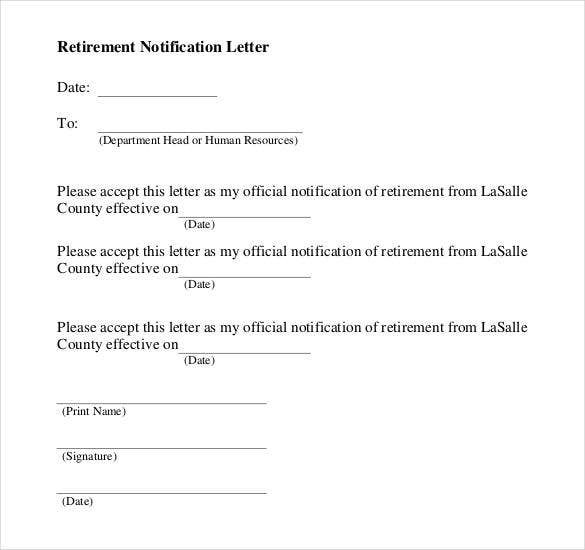 You may also see retirement resignation letter templates. So let’s say that you’re ready to retire and that you want to tell your boss. This means you’ll want to notify him or her by handing over a retirement letter which contains all the details regarding why you have to retire. This article is going to teach you how you’ll create such a document. What Information Should be on the Retirement Letter? 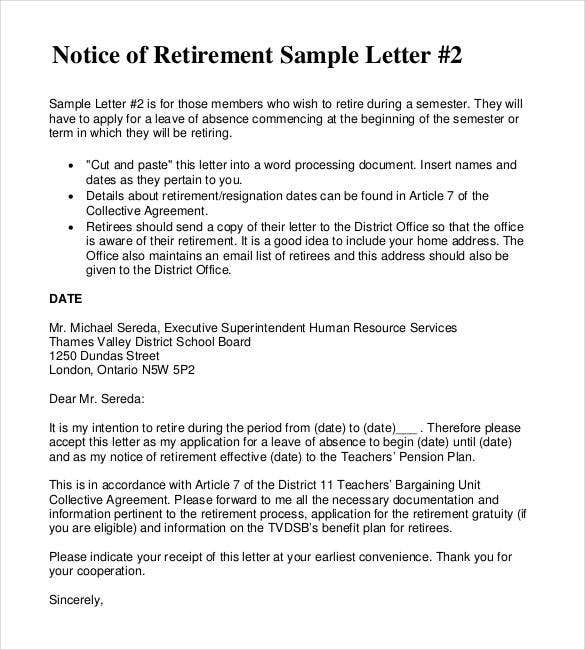 Remember the main reason as to why you’ll need to create this letter is so that you can tell your employer that it’s about time you retire and leave the company for good. But in order for that to happen, your employer will need to gather information regarding your retirement. You may also see sample letters. In the event that you’ll send your boss the letter, then he/she will want to know who it’s coming from. This means that you’re going to have to provide your employer everything from your complete name, job title, address, and contact details (phone number, home number, email address and just about any other means of contact with you.) Also, be sure to point out the date in which you made the letter as it’s important for record keeping purposes. You may also see sample resignation letters. Since you’ll be addressing the retirement letter to your boss, it’s best that you write down his/her contact information. Not only that, but you’ll also need to put all of his/her basic company information into the letter. So this means the document will need to have your employer’s complete name, job title, the name of the company, company address, and contact information. Be sure that you don’t leave anything out and that there are no errors when it comes to these pieces of information. You’ll want to start things of nicely by sending your employer a proper greeting. Considering the fact that this is a retirement letter sample, you have to make sure that you keep the tone as professional as possible. So as you start writing down your salutations, it’s best that you go something along the lines of “Greetings Mr/Ms Last Name” or anything similar. This is the first part of the letter where you’re going to have to explain the reason as to why you have to retire from the organization. No matter what kind of reason it may be, you need to be sure that you’re able to provide all the details regarding why you have to leave. Also, you must remember to treat this like a business letter and remain professional, even if you and the employer you’re sending it to our close. This is also the section of the letter where you’ll need to provide the date on which you plan to retire. You’ll need to do this as you want to give your employer more than enough time to find a replacement for the position that you’re leaving, and letting him/her know when you plan on leaving will definitely help with that. This is the section of the letter where you will be showing your employer your gratitude. Just like all the other parts, you must remember to keep a professional tone at all times. What you will be thankful for must be related to the time that you’ve spent in the company. So you can decide to show your gratitude for all of the different opportunities you were able to take or all of the experiences that you managed to gain throughout your entire tenure with the company. You may also see sample volunteer resignation letters. Even if you think that your boss doesn’t deserve it or that you weren’t particularly thankful for anything, you can at least thank your employer for allowing you to work in the organization for as long as you have. The point is to show your employer how much you appreciate what you’ve been given so that you don’t leave any sort of bad blood upon your departure. Now that you’re done writing the first and middle paragraph, the next step will focus on writing the last one. In this particular section of the letter, you’ll be explaining to your employer that you’re willing to help out with the transition process. Seeing as to how you will be affecting the company should you leave, especially if you hold a title that’s higher than the rest, then the least you can do for your employer is provide your help in finding your replacement. Also, you can event state that even after you retire, you’re still willing to keep in touch with the company by providing them with part-time work; just remember that this is optional and that you don’t necessarily have to do this, you’re retiring for a good reason. And lastly, this is the section of the letter where you close the letter. It’s always best that you do this with the words “sincerely” which is then followed by your complete name and signature. You may also see funny resignation letter templates. In the event that you plan on sending your retirement letter via email, then all you have to do is attach your letter to it. Also, you must put in a proper subject line that will tell your employer what your letter is all about without even the need to open it. So go with something that’s simple, brief, and descriptive like “Retirement – Your last name”. You may also see sample letter of employment templates. Creating the retirement letter is just one step in the entire process. There are other things that you’ll have to do in order for you to leave the company without any problems. You may also see sample personal resignation letters. 1. Before you retire, you’ll need to have a meeting set up between you and your employer. You’ll want to notify your employer that you plan on leaving the company, and the best way for you to do that is if you bring up the matter of your retirement through a one-on-one meeting. This will mean that you must find the appropriate time in which you may ask your employer to discuss the matter with you, as well as ensuring that two of you do so in a secure and private location. You want to guarantee that the two of you have all the time needed to discuss how your retirement will, and you’ll want a private area so that you can discuss these matters openly without the fear of anyone listening in. 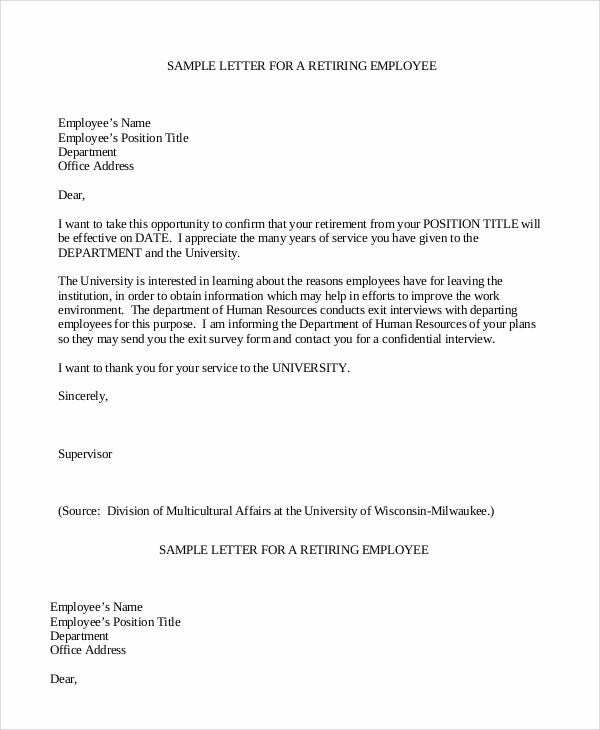 You may also see sample retirement resignation letters. 2. Give the date as to when you would like to retire. Although you have already written this down in the letter, you’ll still need to talk about this with your letter. Remember that your employer will need to learn about the date you plan on retiring as he/she will need to make all the arrangements necessary for the transition process. Also, he/she may require you to stay for a little longer than the date that you plan on leaving so that certain tasks can be completed or so that he/she has enough time to find a suitable replacement. So learning the date of your departure can help in the event that two of you make agreements regarding when you may leave the company for good. You may also see employee resignation letter templates. 3. Mention all of the achievements you have been able to gain through your time in the company. You want to show your employer that you have been a valuable asset and that you have more than earned your right to retire. 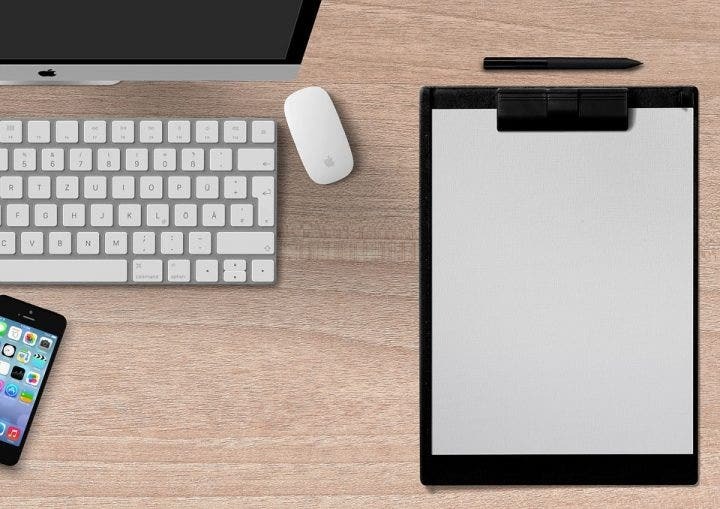 So whether you’re writing them in the retirement letter or stating them via a private meeting, you’ll want to point all of them out as clearly as possible. State all of the successes that you have been able to achieve throughout your run in the company. If you think that there isn’t anything that you can mention, then you can at least state the years of service that you have provided the company as well as what you have been able to contribute. While it may seem like something trivial to you, it’s still better than saying nothing at all. You may also see resignation letter word templates. 4. Express your gratitude. You want to thank your boss for what you have been able to gain during your run through the organization. The reason as to why you’ll want to show your appreciation is because you’ll still want to have good relations with the company even after you depart; you’ll never know just how handy that can be in the future. So you can thank your employer for the opportunities that you have been able to take or the experiences that you were able to gain while working under him/her. If you aren’t able to come up with anything you’re particularly thankful for, especially if you were unhappy through the majority if your employment, then you can at least thank the employer for the opportunity to work for the company. Remember that the tone has to remain professional and cordial all throughout as this is still a business letter. 5. Send a copy of the letter to the Department of Human Resources. Once you have finished discussing the matters regarding your retirement with your employer and handing over the letter, then the next steps is to hand over a copy of it to Human Resources. The reason as to why you’ll need to do this is because you have to ensure that they have the letter on your personal employment record. This will make it much easier for you to gain access to your benefits upon your departure and it can help validate that you’re going through the retirement transition process. 6. Never forget to hand over your contact information. There might come a situation where something is preventing your employer from approving your retirement and he/she will need to contact you to help deal with it. Which is exactly why you’ll need to provide your contact information so that you will be notified about any problems that could impede your plans on retiring. So be sure to give the company your phone number, home number, email address and just about any means of contact with you. You may also see organize a resignation letter. If you would like to learn more on how to create retirement letters or anything that’s related to the topic, then all you have to do is go through our site and find the articles you need. Who knows? You may just be able to acquire the information that can help you and your business out. You may also see letter of resignation templates.